But Dr Flook wears many hats. He’s also Clinical Professor with the U of A’s Department of Family Medicine, as well as Chief of Family Medicine and Women’s Health at the community-based University Hospital family medicine clinic and, the “big job” he’s taken on most recently, Director of Practice Improvement for the Physician Achievement Review program under the auspices of the College of Physicians and Surgeons of Alberta. Convinced that there was a better way to track the myriad drugs some patients were being prescribed, he spent 12 years “working with a lot of bright dedicated people” setting up Alberta’s Pharmaceutical Information Network. “I really liked the idea and got involved at the grassroots level. Today, many doctors don’t know how they could operate without it,” he says. 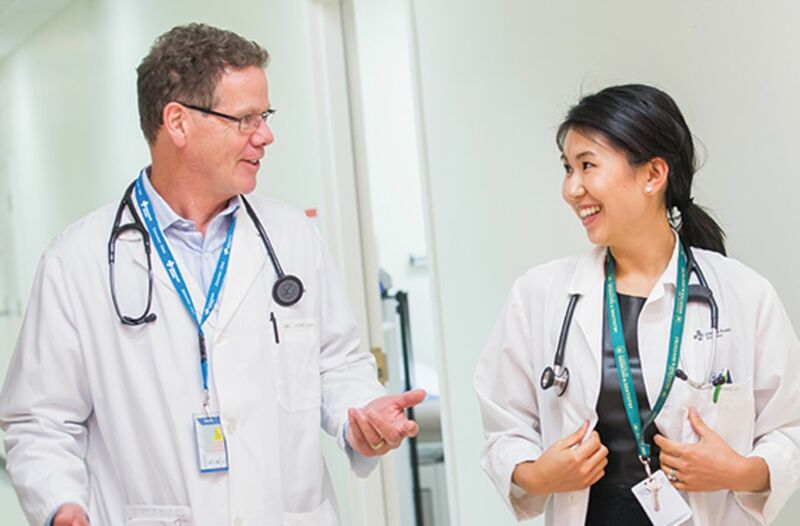 And because of concern that many HIV patients and others with high health needs in the community didn’t have access to family doctors, U of A’s clinic is working to provide after-hours family medicine services to at-risk individuals who would otherwise rely on walk-in clinics or emergency wards. 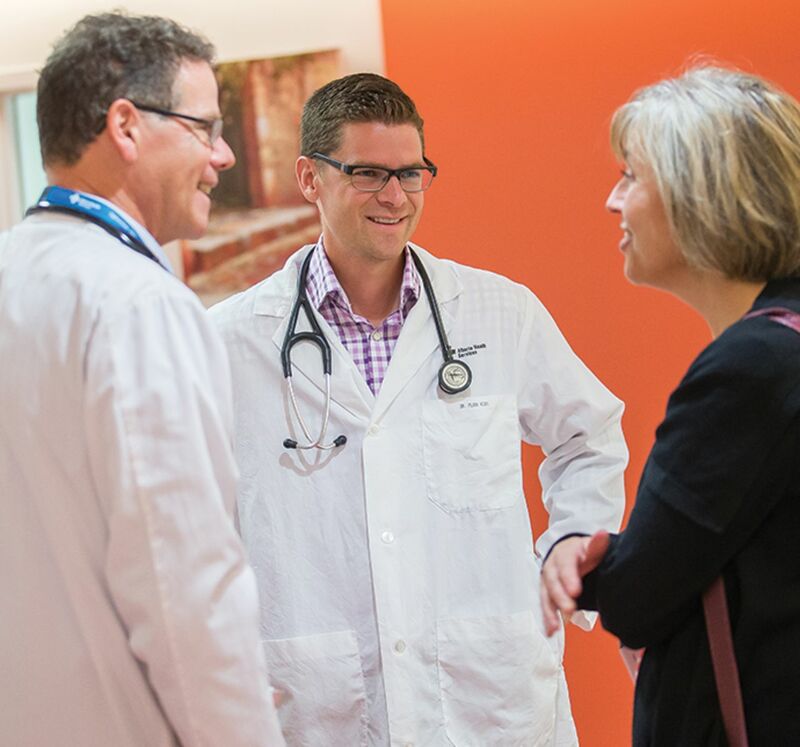 “We plan to involve students and family medicine residents in the model for this care and are very excited about the opportunities,” he says. PHOTOS (RIGHT): Dr Flook (above) with his wife, Maureen, and children (left to right) Robert, Adam, and Claire, along with their beloved family horse Marie (family photo submitted by Dr Flook). Highly valued office assistant Melanie Ochitwa and Dr Flook plan the busy day ahead (left). Patient Darlene Meier shares a light moment with Dr Flook and his son Robert (bottom). PHOTOS (LEFT): Dr Flook (top) in conversation with a patient who has received care in his family practice for more than 35 years. 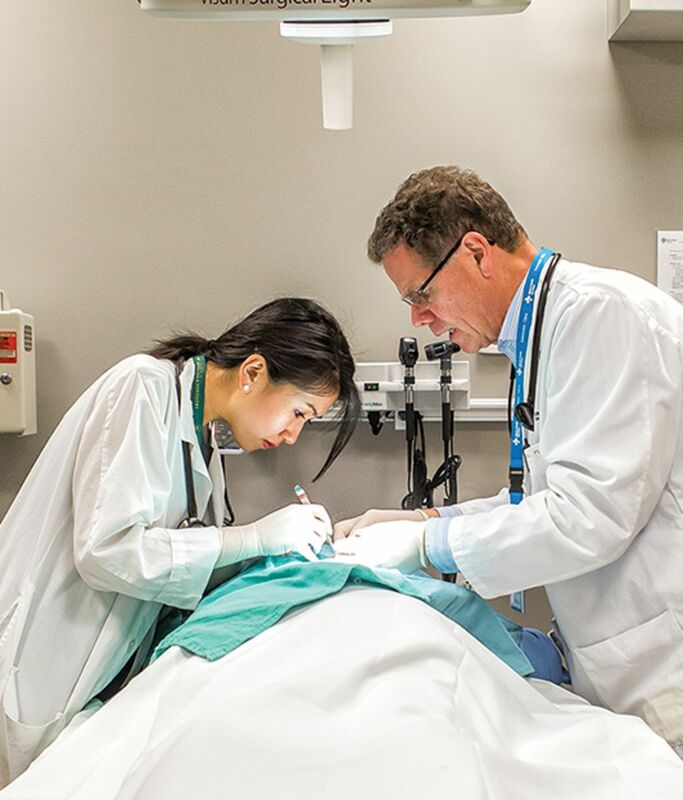 Dr Flook (far left) supervises the work of resident Dr Stephanie Liu during a procedure, and offers words of encouragement to Dr Liu before the procedure. 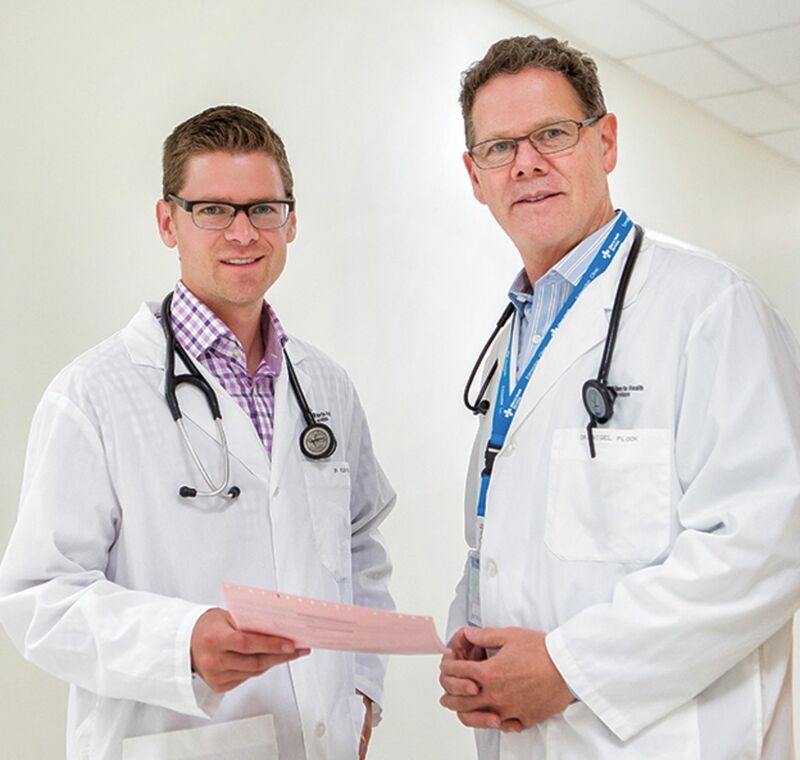 Dr Flook (bottom) with his son Dr Robert Flook, who is in his final year of family medicine residency. 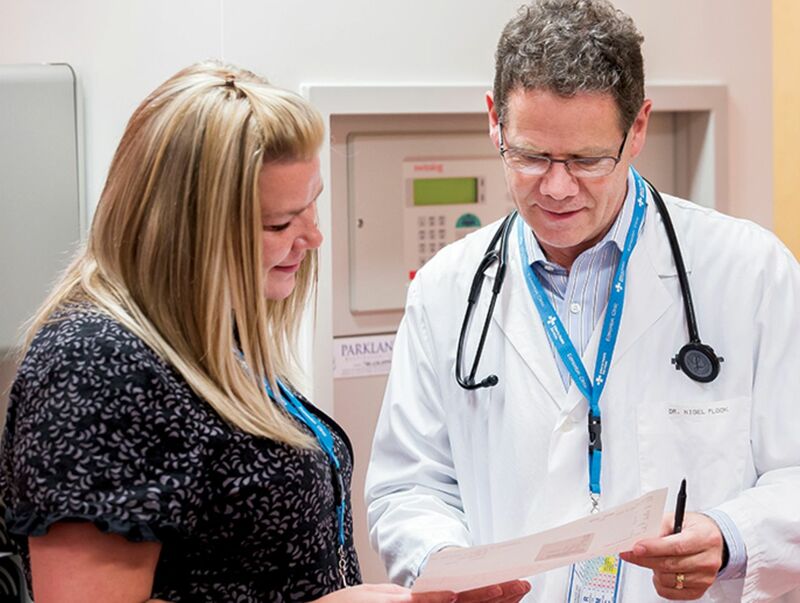 Dr Flook is Clinical Professor and Chief of Family Medicine at the University Hospital and Kaye Edmonton Clinic in Edmonton, Alta.